The Optare Spectra bodied DAF double deckers have been the mainstay of the Wilts & Dorset fleet for nearly 24 years. The first ‘step entrance’ examples entering service in April 1993. The first ‘low-floor’ buses were introduced in 1998. The Spectras were employed on routes all over the Wilts & Dorset empire, so a common sight in rural Wiltshire or along the coast in Dorset and Hampshire. The first Spectra, 3101 was retired from the fleet in March 2009. The last low-floor Spectra is 3185 and was delivered in 2003, just as Wilts & Dorset were acquired by the Go-Ahead Group. Due to Government legislation, the Disability Discrimination Act became effective from 1st January 2017, meaning that double deckers not adapted to meet its requirements had to be withdrawn from stage carriage service by that date. With this in mind, George Cooper arranged a running day to say farewell to the Spectra. Most of the existing fleet had been sold to a new owner in Lincolnshire for contract work and would leave the south by the end of December 2016. 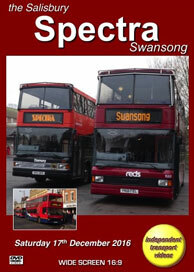 The day of the event was Saturday 17th December and two Spectras and a Volvo Olympian were to be used, duplicating the normal services, which would run ahead of the specials. As the remaining Olympians would also fall foul of the DDA rules it seemed fitting that an Olympian should help the Spectras out on this special day. The vehicles chosen were Damory 1655 (R155 NPR) still wearing its ‘Stonehenge Tour’ livery, 1668 (Y168 FEL) in Salisbury reds livery and Volvo Olympian 4756 (R756 GDL) with Northern Counties bodywork still carrying the final version of the Wilts & Dorset livery. The day starts at Ringwood Bus Station where we join 1655 which is operating an X3 service from Bournemouth to Salisbury. The sights and sounds are enjoyed as we ride to the city centre and meet up with 1668. Our filming uses many locations around Salisbury city centre in-between each journey that we make onboard the Spectras. We then ride on 1668 operating service 66 to Idmiston Bridge and return to the city to join 1655 to do a short journey on the Activ8 service to Old Sarum and back. We then ride on 1668 to Salisbury coach park for a photo shoot of all three vehicles with ‘Salisbury’ - ‘Spectra’ - ‘Swansong’ displayed on their destination blinds! From here we ride on 1668 on the X7R service to Romsey. We meet 1655 at Romsey and join it to ride ‘local’ service 30 to Halterworth. From Romsey both Spectras return to Salisbury. We are then privileged to see the Spectras running through the wash at the Salisbury reds depot in Castle Street. With day turning to night, we then ride on 1655 with Olympian 4756 on the Activ8 service to Amesbury, returning to Salisbury as an X4. Our final ride is with both Spectras on the X3 service to Ringwood. Our cameras travel onboard 1668 to Ringwood for the final journey. From Ringwood 1668 returned to Salisbury and 1655 did the final ever journey to Bournemouth as an X3. It then returned to Blandford and within a few days it had left the fleet. We would like to thank everyone that helped with the day to give the Salisbury Spectras a really good final Swansong!